US Drought Monitor November 6, 2018. 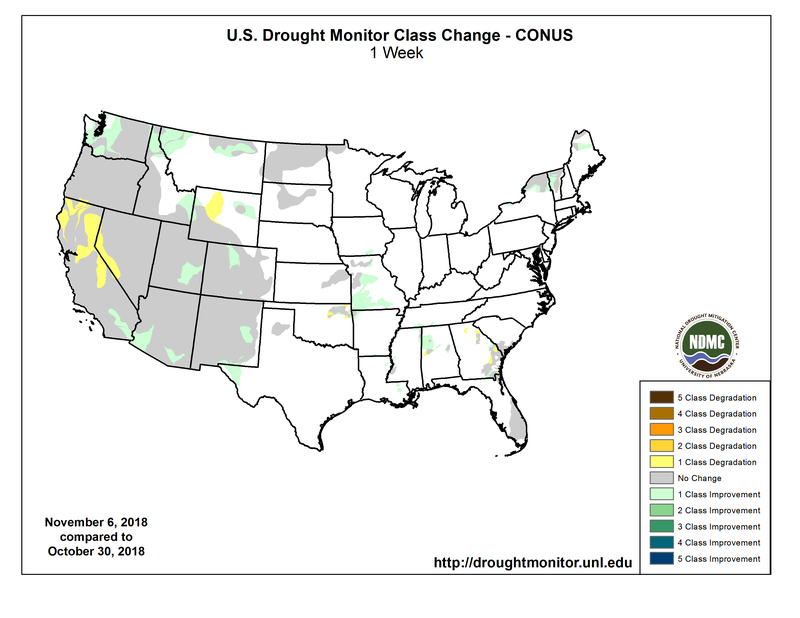 West Drought Monitor November 6, 2018. Colorado Drought Monitor November 6, 2018. The NWS WPC 7-Day Quantitative Precipitation Forecast (QPF) calls for light-to-moderate accumulations ranging from 1-to-2.5 inches along the Gulf Coast from Texas to the Florida Panhandle as well as in coastal areas of the Carolinas. Similar rainfall amounts are forecasted for eastern portions of New England. Out West, dry conditions are expected across the region with the exception of some lesser accumulations (<1 inch) across the northern Rockies of Idaho and Montana. The CPC 6–10-day outlook calls for a high probability of above-normal temperatures across California and western portions of Arizona, Nevada, Oregon, and Washington while the eastern two-thirds of the continental U.S. is forecasted to be below normal. In terms of precipitation, above-normal amounts are expected in the Eastern Tier and southern portions of Texas while below-normal precipitation is expected across the Midwest, Great Plains, and most of the West.